Save money and get a significantly better product than the leading brand. Not all stretch wrap films are made the same. Many brands try to cut costs by using cheaper materials and packaging. At Dasher Products we spare no expense in delivering a top quality product. Through our research and development, we have been able to produce the highest quality shrink wrap by focusing on where it counts most. 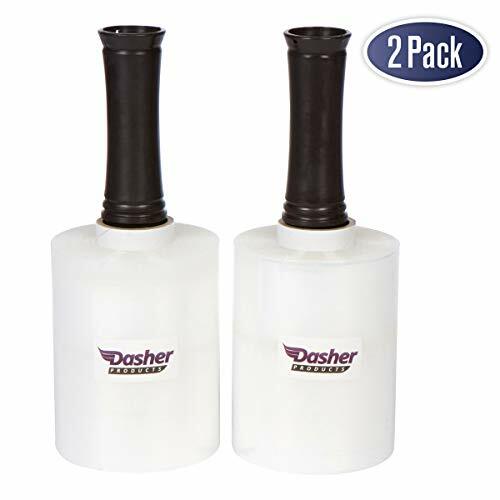 Dasher Products is your best and most trusted source. INDUSTRIAL GRADE STRETCH WRAP - Our heavy duty stretch wrap is made of a durable 80 gauge film. The non-adhesive shrink wrap will stick only to itself to create a stronger cling for a quick and simple application. DURABLE PLASTIC HANDLE - Each roll comes with its own reusable plastic handle. Most of the other stretch wraps feature a cheap cardboard handle that is static and will not spin. This handle however allows the stretch wrap to spin around it which reduces burns and strain to your hands and wrists. MULTIPURPOSE USE - Prefect for bundling and securing all types of items. It's perfect for wrapping furniture, suitcases, picture frames, boxes, pallets, and loads that are uneven or difficult to handle. Whether you are looking to store, ship, pack, move, or travel you will find an endless amount uses for this stretch wrap. TWO PACK BUNDLE - Each order contains two rolls of stretch wrap with two reusable plastic handles. Each roll is 5 inches wide x 1000 feet long and the 80 gauge thickness film is extremely strong. 100% GUARANTEE - No questions asked return policy. We believe that we have the best solution and product on Amazon, but if you're less than completely happy you made the choice to click that "Add to Cart" button, send it back for a full refund or replacement. Guaranteed. If you have any questions about this product by Dasher Products, contact us by completing and submitting the form below. If you are looking for a specif part number, please include it with your message.